, son of the preceding, by Anne, daughter of sir Thomas Dacres of Hertfordshire, was born in 1646, and educated with great care under the eye of his father. He became early attached to the study of antiquities, and as he had a very considerable estate settled upon him, he lived chiefly upon it, pursuing his studies and exercising old English hospitality. He was elected to represent his county in parliament as often as he chose to accept that honour, and his knowledge and integrity induced many of his neighbours to make him the arbitrator of their differences, which he readily undertook, and generally executed to the satisfaction of both parties. He married Louisa, daughter to sir John Carteret, of Hawnes in Bedfordshire but having by her no issue male, his father settled his estate on the male issue of sir Edward Atkyns, which settlement was the unfortunate cause of a law-suit between the father and son. Sir Robert differed in other respects from his father’s opinions, being more attached to the house of Stuart, yet he inherited both his prudence and his probity, and was equally esteemed and beloved by men of all parties. 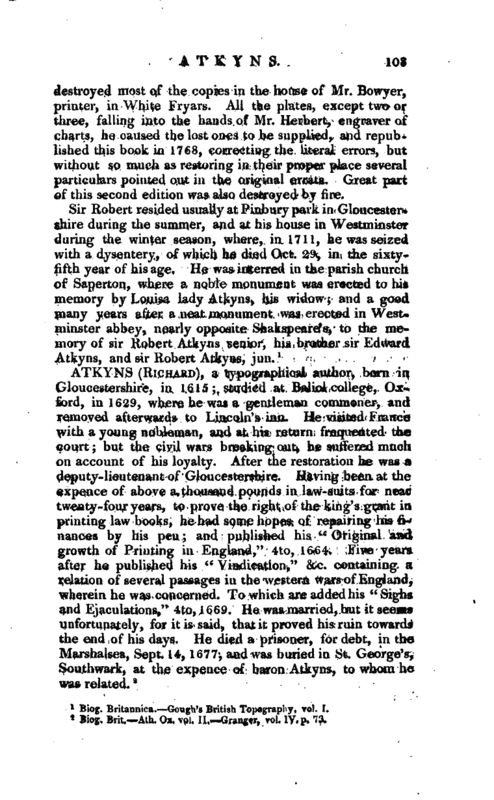 His design of writing “The History of Gloucestershire,” took its rise from an intention of the same sort in Dr. Parsons, chancellor of the diocese of Gloucester, who had been at great pains and trouble to collect the materials for such a work, in the compiling of which he was hindered by the infirm and declining state of his health. 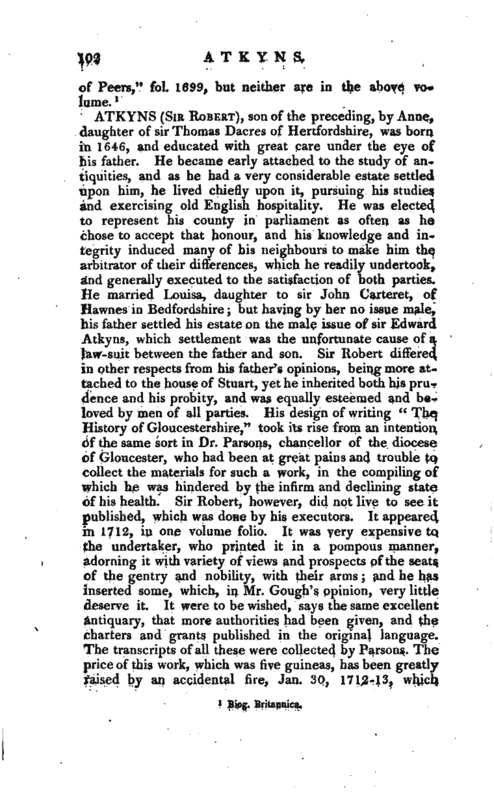 Sir Robert, however, did not live to see it published, which was done by his executors. It appeared in 1712, in one volume folio. It was very expensive to the undertaker, who printed it in a pompous manner, adorning it with variety of views and prospects of the seats of the gentry and nobility, with their arms and he has inserted some, which, in Mr. Gough’s opinion, very little deserve it. It were to be wished, says the same excellent antiquary, that more authorities had been given, and the charters and grants published in the original language. The transcripts of all these were collected by Parsons. The price of this work, which was five guineas, has been greatly raised by an accidental fire, Jan. 30, 1712-13, which | destroyed most of the copies in the house of Mr. Bowyer, printer, in White Fryars. All the plates, except two or three, falling into the hands of Mr. Herbert, engraver of charts, he caused the lost ones to he supplied, and republished this book in 1768, correcting the literal errors, but without so much as restoring in their proper place several particulars pointed out in the original errata. Great part of this second edition was also destroyed by fire. Biog. Britannica. Cough’s British Topography, vol. I.